Some things never change, and some things are constantly evolving. Every September, our Canadian kids head back to school following the Labour Day long weekend. It happens every year. It still feels like summer out, but all too soon, the leaves will begin to change; autumn arrives; temperatures dip to manageable numbers, and somebody – whether it’s a parent, a caregiver, a sibling, or the child herself – has to pack her lunch, five times a week. At Borderline Systems, where our warehousing, order packaging and fulfillment teams all have families, we know how difficult it can be to get children out the door in the morning, with a breakfast in them, and enough food to see them through the day. We also know that, just as much as their lunch bag contents are important, it is perhaps more important that they remain adequately hydrated. For parents, this may mean putting pre-packaged drinks in the bag, or purchasing reuseable containers that probably will leak inside a child’s knapsack, because they are too large to fit properly. Pre-packaged drinks can get expensive, for families trying to cut back on their grocery budgets. Purchasing a reuseable container for liquids is a great idea: Buy once, use all year, right? It pays, though, to get the correct size of reuseable container; one that is leak-free; will fit comfortably in a child’s lunch bag; with a straw that is attached. Our Borderline families know just what you need, to keep children hydrated while reducing cost, waste and spills. It’s the product called “Drink in the Box,” and it’s made by Precidio Design Inc., a Canadian housewares company located in Oakville, ON. Borderline is proud to have partnered with Precidio to carry the company’s products for warehousing and filling e-commerce orders. 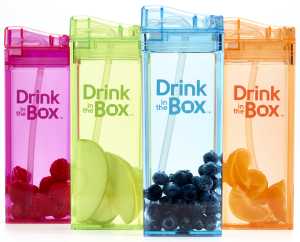 Drink in the Box is made from made from BPA-, BPS- and Phthalates-free material called TRITAN™. This is a premiere, American-made material used heavily by quality housewares companies and the medical products industry. Tritan™ is durable, dishwasher safe (top shelf only), and will not leach any chemicals into the liquids you and your family drink. It also falls in line with many school boards’ eco-friendly lunch policies. But it isn’t just for children: Drink in the Box is available in several colours in both 8oz and 12oz sizes. Some of our Borderline team members use them, too, transporting water infused with fresh berries, and filling several times a day from our water fountains, as needed. Seeing our Borderline family using one of the products we help distribute is a high recommendation for that item’s reliability: We think Precidio has designed a winner in the fight to save our planet. It’s never too late to make changes to join that fight. Remember: One fewer pre-packaged drink container in the trash is one fewer item in our landfills. Our children, and our children’s children, will some day thank us for making little changes, just like this one. Want to know more? Visit Precidio Design Inc. HERE to view products and get more information.